This Live Blog session closed at 16:52 on 29 Jun 2015. Global equities, the euro and German Bund yields are all sharply lower as markets react to the imposition of capital controls in Greece. 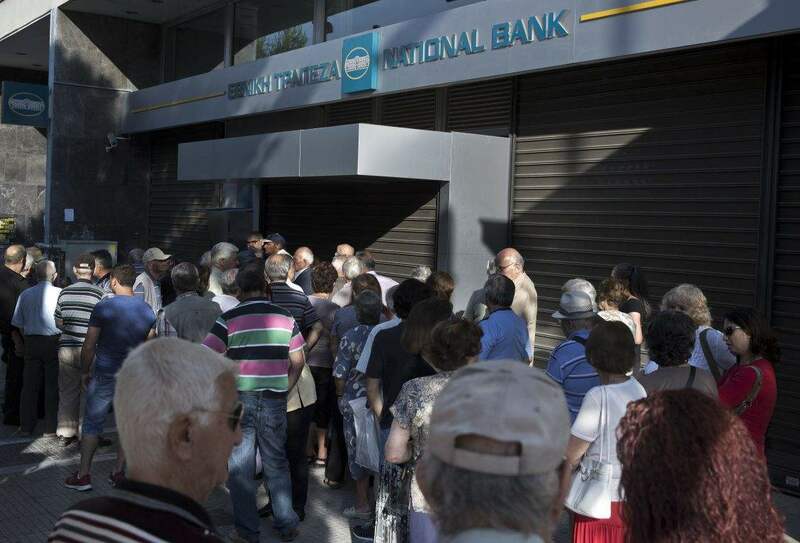 Greek banks are closed this morning, triggering long queues at ATMs. Morning all. Where to begin? Some Greeks who had not read the news knocked on locked doors at 8am, only for security guards to move them on, while others withdrew their daily limit of €60 from cash machines that had been inundated with withdrawals all weekend. Grey steel shutters covered the entire ground floor of the huge Alpha Bank headquarters on the city’s Stadiou street. Security guards manned the building’s small side entrance down an alleyway, where employees were allowed in, but desperate customers rejected. Kostas, a 51 year old depositor, was refused entry and sent away after pleading with guards. Tobias Buck, reports from Spain that Luis de Guindos, Spain´s economy minister, insisted on Monday that “Greece will remain a member of the eurozone”, warning that “the alternative would be much worse for everyone”. Speaking on Spanish radio, Mr de Guindos also voiced confidence that Spain was in a strong position to withstand the fallout from economic turmoil in Greece. European markets update. Nathalie Thomas reports that equity investors are “heading for the hills”. • Germany’s Xetra Dax has fallen 3.7 per cent, or 423 points, at publication time to 11,064. • In France, the CAC 40 is 4 per cent lower at 5,059.17. • The FTSE Eurofirstis down 2.3 per cent, or 37.24 points, to 1536.84 points. • The UK’s FTSE 100 has lost 2.2 per cent, or 149 points, to 6,606. Earlier, Pierre Moscovici, the EU economy commissioner, said it was not too late to reach a deal between Greece and its creditors that would lead Athens to campaign in favour of staying within the eurozone, Anne-Sylvaine Chassany reports from Paris. Mr Moscovici also underlined that Europe had “all the fire-walls” to withstand a Grexit, which would have “limited impact on the French economy and Europe”. French President Francois Hollande is convening a ministerial meeting on Greece on Monday morning, the Elysee said. The euro shed as much as 2 per cent against the dollar to lose the $1.10 mark and hit, its lowest since June 2. But it has since regained some of its poise to trade down 0.8 per cent at $1.1075. Against the yen, the shared currency’s fall was more pronounced, exacerbated by the haven appeal of the Japanese unit. The euro weakened 2.5 per cent, with only Y134.88 required to buy a unit of the European currency. In case you missed it, the FT’s Katie Martin did a very good cut-out-and-keep guide last night to what some key analysts are writing about the latest developments in Greece. In addition to Greek banks staying closed all week, the equity and bond markets will also not open through July 6, the country’s Capital Market Commission has decided. David Cameron has been on the BBC this morning, mostly talking about terror in the wake of the Tunisia attack. But he was also asked about Greece. He was asked: Will Sunday’s referendum effectively be a vote on whether to stay in the euro? Michael Mackenzie The FT’s markets editor, is picking up on the increasing volatility in European equity markets. The FT commentators are out in full force this morning as the Greek crisis triggers selling across global markets. Stephanie Flanders argues that now eurozone policy makers have reached the end of the line with Syriza and markets appear to be baulking, investors need to decide how much they actually care. If and when Greece defaults, it will be defaulting on taxpayers and the ECB itself. Could investors with minimal exposure to Greek assets and confidence in the ECB’s new tool kit be tempted to consider it a non-event? Meanwhile Wolfgang Münchau says that Alexis Tsipras was right to walk away from negotiations this weekend, although his decision to call a bailout referendum is more difficult to understand given the offer on which Greeks will vote is no longer on the table. He ponders what will happen if the Greek electorate vote Yes but Greece is still forced out of the eurozone, suggesting that “a monetary union without political union can only exist in violation of basic principles of democracy”. And lastly HSBC’s Chief Global Economist Stephen King warns that as Grexit looms, the theory that the euro is a single currency will be severely tested given it lacks a single cohesive political, legal and fiscal underpinning. He suggests that eurozone members will need to find ways of pooling sovereignty, accepting the need for common fiscal decisions and reducing the ever-growing strain between creditors and debtors in order to avoid a dangerous – and potentially contagious. Earlier today the European Commission issued a formal declaration on the imposition of capital controls in Greece. It’s a bit boilerplate but shows that the move has been given the formal stamp of approval. While the imposed restrictive measures appear necessary and proportionate at this time, the free movement of capital will however need to be reinstated as soon as possible in the interest of the Greek economy, the Eurozone, and the European Union’s single market as a whole. The FT’s political editor George Parker is reporting that David Cameron will meet officials later today to put “the final touches” to British contingency planning in the event of Grexit. The advice will include how much cash British tourists should take on holiday to Greece, guidance for pensioners who have retired to the country and consumers with deposits with Greek banks operating in the UK. Cafes along central Skoufa street, usually filled with a Monday mid-morning crowd exchanging gossip and tips from a weekends on an Aegean island were almost empty. In about 40 minutes many eyes will turn to Berlin where Chancellor Angela Merkel is making a speech. It should have been a celebration – the 70th anniversary of the founding of her CDU party, writes the FT’s Stefan Wagstyl in Berlin. But the mood is grim, with the idea of European unity – a key CDU theme for the past seven decades – now put into question. Ms Merkel is not expected to make any policy announcements in her speech, But the audience – and millions of other Europeans – will be hanging on every word she says about Greece. Immediately afterwards she is holding an emergency meeting of all the parliamentary party leaders. She will report on the situation as she sees it – and then listen. The meeting is private but word of what was said is bound to leak out – and will be closely followed. Market update. Things are still ugly but not quite as abjectly awful as they were…. The euro is now down by 0.8 per cent against the dollar, which means it has clawed back half of the ground it lost at the open. At pixel time, it’s at $1.1075. Bunds, a favoured retreat in times of stress, are in demand, but not at quite the same pace. Yields (which drop when prices rise) are now down by 14 basis points, which is more modest than the earlier 20 basis point slump. The yield now stands at 0.778 per cent for the 10-year debt. Peripheral debt yields are higher, but again, not as aggressively as they were earlier. Yields are up by 17 basis points in Italy, about the same for Spain, and a little more, 20 basis points, for Italy. William Hill has stopped taking bets on the likelihood of Greece exiting the eurozone before 2016, after punters rushed to put their money on the possibility over the weekend, writes Natalie Thomas. In such a volatile situation in which events can move very quickly it is very difficult to be confident that our odds are accurate.The only option people have been wanting to back for the past couple of days is that Grexit will happen this year and as we can no longer hope to balance our market so we have decided to pull the plug. The company said that when it decided to stop taking bets on a Grexit, the odds were 2/9 (i.e. if you bet £9, you would win £2) that Greece would remain in the eurozone until 2016, while the odds of a Grexit happening this year had been cut from 5/1 to 3/1. Where there’s life there’s hope, or so believes Alexis Tsipras, the Greek PM. Peter Spiegel has obtained a copy of the letter Tsipras sent to Xavier Bettel, the prime minister of Luxembourg – who takes over the EU’s rotating presidency this week, and all other eurozone heads of government asking for an extension of the bailout until after the referendum. Eurozone ministers have already refused to do this. “I would like to request that your government re-examine its position on the issue and support the reconsideration of the request of the Hellenic Republic by the finance ministers of the eurozone with a view to granting it. This decision will contribute to our common goal of reaching a mutually beneficial agreement, to secure fiscal, financial debt sustainability, that will return Greece to growth within the eurozone. The Swiss National Bank intervened overnight to stabilise the franc, after the euro tumbled against the safe-retreat currency as the situation in Greece took several unexpected lurches for the worse over the weekend. A spokeswoman for the SNB confirmed to fastFT that the central bank took action overnight to stabilise the currency market, following remarks by Thomas Jordan, chairman of the bank’s governing board, at a conference in Bern on Monday morning, writes Nathalie Thomas. The bank did not provide further details of its intervention. Mr Jordan has been speaking at the Swiss International Finance Forum on Monday. 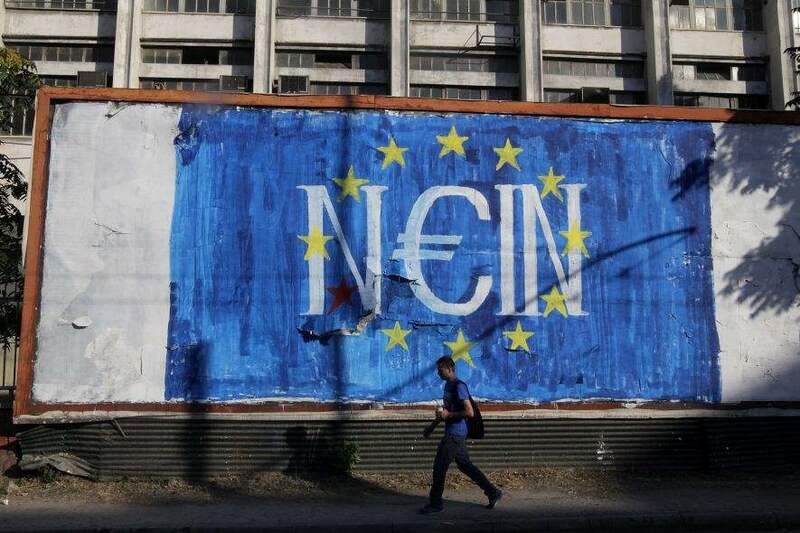 The campaign for Sunday’s referendum in Greece -officially on the bailout plan that prime minister Alexis Tsipras rejected last week but really a vote on staying in the euro – is just beginning, reports Kerin Hope in Athens. Mr Tsipras’s Syriza party has come up with a populist measure that seems likeiy to win plenty of support for a “No” vote. The transport ministry has announced that travel on public transport in the capital will be free from today until July 6 – the day after the vote. That means free rides on buses, the Athens metro, trolleys and a tram to the seaside suburbs. But passengers will still have to pay on one means of transport: the suburban rail line that runs to Athens international airport. The Greek government informs those visiting or about to visit Greece, that the announced measures restricting the movement of capital do not affect in any way those who wish to make transactions or ATM withdrawals using debit or credit cards issued abroad. It should be also noted that there is ample availability of both fuel and all products and services that ensure a smooth and fun stay for the visitors in every city, region and the islands. Greece continues to guarantee a high level of quality of services offered to visitors who have made our country a top tourist destination worldwide. The Minister of Tourism Elena Kountoura reiterates that the Greek tourism remains high in the preferences of our visitors. The tourists who are already here and those who are planning to come, will not be affected in any way by the events and will continue to enjoy their holiday in Greece with absolutely no problem. Some bank branches in Greece are going to open later this week, Kerin Hope reports. A few branches of National Bank of Greece are going to open to serve pensioners. The other three systemic banks are worried about security and may not follow suit. The government has struggled to pay pensions every month since February because of the dire state of the public finances. It scraped up a final €300m to meet the €1.8bn bill only last Friday by raiding the coffers of a special investment fund at the central bank. That was after the Union of Bank Employees refused to lend the government over €150m from their cash reserves. 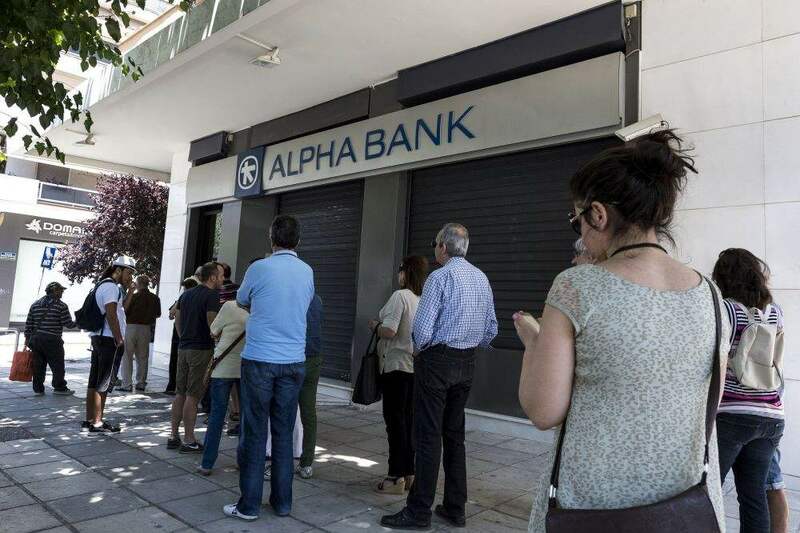 Savers in Greece withdrew more than €8bn from the country’s banks in the last fortnight alone, according to rating agency Moody’s, before capital controls restricting the amount that customers could take out came into force today. In response to the heightened uncertainty triggered by the referendum announcement, Greek households have withdrawn deposits at an accelerating pace during this past weekend, concerned about the prospect of impromptu bank holidays, deposit freezes and ultimately the risk of a forced redenomination into a new currency. We estimate that private-sector deposits have declined by around €44 billion since the end of last November to approximately €120 billion today. Outflows in the last two weeks alone were in excess of €8 billion. Looking ahead, it remains uncertain how the Greek government will meet its forthcoming debt obligations. In addition to the repayment to the IMF at the end of June, payments are due to the ECB of a total €6.7 billion in July and August. The first payment to the ECB is for €3.5 billion on 20 July. Private-sector bond holders have repayments and interest payments of approximately €400 million through the rest of the year. Clearly, Alexis Tsipras’s letter to heads of government (see 9.52am) didn’t cut much mustard in Germany. Stefan Wagstyl reports from Berlin that the German government is sticking to its tough line on Greece. At a press conference, Chancellor Angela Merkel’s spokesman indicated that the government was sticking to the decision made by the eurogroup finance ministers on Saturday – ruling out any further extension of the current aid package beyond Tuesday. Steffen Seibert said Ms Merkel was “ready to speak to Greek premier Tsipras whenever he wants” but following the referendum decision, the situation was now “in a different phase”. His message was that having decided on the referendum, the Greek government was on its own. On the one hand desperation to keep the euro could push Greeks to accept more austerity; and the immediacy of massive default costs may push Eurozone politicians towards a last ditch agreement. On the other hand, it is feasible that mutual frustration is based on such fundamentally misaligned incentives that capital controls turn out to be a point of no return. FT economics writer Martin Sandbu is answering reads’ questions on the Greek crisis on the FT’s Facebook page from 11.30am London time. We’ll post some of the highlights. Holger Schmieding, from Berenberg, is pretty optimistic on the risks of contagion from Greece. 2015 is not 2011 or 2012. The systemic euro crisis is over. With the ECB’s OMT programme as the ultimate safety net, with banking union and well-oiled crisis-response mechanisms, Europe has the instruments it needs to contain contagion. Thanks to their reforms in the meantime, Italy and Spain are now in much better shape and hence much less vulnerable than they were four years ago. Over of the FT’s Alphaville blog, Paul Murphy and Bryce Elder are just about keeping their heads above the rising waters of strategy research and discussing the market reaction to events in Greece. Markets update from Michael Hunter, who says banks are leading losses across eurozone stock markets. Overall, the FTSE Eurofirst 300 is down 2.5 per cent. The Xetra Dax 30 is down 3.5 per cent in Germany, while France’s CAC 40 is down 3.5 per cent. The Ibex 35 in Spain is down 3.9 per cent, and Portugal’s PSI 20 is 5.6 per cent lower. Investors are continuing to run from peripheral eurozone government bonds to the haven of German paper. Meanwhile the yield on 10-year bunds is down 15 basis points at 0.77 per cent, and at the epicentre of the crisis, Greek 10-year debt yields are up 367 basis points, or 3.67 percentage points, at 14.55 per cent. Greek government debt due in 2017 is yielding 33.31 per cent, up 1,200 basis points, or 12.07 percentage points. On the eurozone periphery, Spain’s 10-year sovereign yields are up 18 basis points at 2.29 per ccent and Portugal’s are up 28 basis points at 2.99 per cent. Over at Jefferies, David Owen has a gloomier perspective on what Grexit might entail for the rest of Europe. At the moment, spread widening has been limited by the knowledge that the ECB will be buying in the sovereign space, along with ABS and Covered Bonds; but of course there is no such safety net for equities, credit and other assets. From our perspective, a Greek disorderly exit might set European recovery back 3-6 months, but there is a significant tail risk that things turn out a lot worse this. Jean-Claude Juncker, the European Commission president, is giving a press conference in five minutes. You can follow it here. Joe Weisenthal at Bloomberg TV shows how the euro is reversing many of its losses since this morning. The embattled Greek government still has a friend in Spain – the anti-austerity Podemos party that is allied with the ruling Syriza movement in Athens, reports Tobias Buck in Madrid. Syrizia’s election victory earlier this year was welcomed enthusiastically by Podemos leaders, despite warnings that an economic meltdown in Greece might damage the Spanish party’s prospects in the polls. Even on Monday, however, Podemos showed no sign of distancing itself from the Greek leadership, or its negotiating stance with European creditors. Juncker: I feel betrayed in the current impasse with Greece. We have all tried to do everything we could. We don’t deserve the criticism levelled against us. Juncker: Countries have to put individual priorities behind them. Other countries showed responsibility in implementing austerity. Juncker: The Greek people are very close to my heart. This is not lip-paying service. I tried again and again to be on the side of the Greek people. I know the hardship they have been through and I have always said we need to pay more attention to the social fairness of the programmes. Juncker: These negotiations have always been based on mutual trust. There has never been an ultimatum or “take-it-or-leave-it” approach. We have always wanted a fair and balanced deal. He adds the creditors have incorporated many Greek demands and changes, and that the Greek proposals were often late or awkward. Juncker: There are no wage cuts in this package. There are no pension cuts in this package. In fact it creates more social fairness and a more modern and fairer public administration. I would have expected the Greek government to push this agenda in line with its campaign manifesto. This is not a stupid austerity package. It goes beyond fiscal measures, lowers the fiscal targets and gives the government more time to meet them. Juncker: Everyone should contribute to the welfare system according to their means. The package means social fairness by targetting support to the most vulnerable, by implementing a minimum income scheme and not targetting cuts in areas affecting ordinary citizens. We were right to ask for cuts in the defence budget. The package means more social justice by fighting corruption, by supporting more transparency and efficiency of the public administration, including an independent tax administration. Who could be against that? Our offers of technical assistance have not entirely been taken up. This package also means more growth and more investment. But there are no quick fixes to the Greek problems. Why are the prices of energy and some commodities among the highest in Europe? Because there is a lack of competition. Juncker: The biggest impediment to growth is uncertainty that can be removed by agreeing to a deal. Juncker: Wehre are we now? The Greeks walked away from the negotiation table unexpectedly on Friday night. It happened at the worst moment. An agreement could unlock new disbursements to help the Greek economy. We also said we were willing to discuss debt rescheduling. Juncker: We moved mountains until the very last minutes when the Greek authorities closed the door. I don’t have to make new proposals today. I am describing proposals that we could have easily reached agreement on at the eurogroup meeting on Saturday. What do the Greek people know about this offer? Juncker: They have to know what is the truth. They have to know what was on the table. They have to know all the elements. It would be advisable to the Greek government if it spoke the truth to the Greek people. Juncker: We’re not here to accuse others, it’s to show that we want to serve people. The other eurozone member states have taken great pains to mover closer to Greece, ignoring sensitivities of their own people. It’s time for Greeks to speak up and shape their own destiny, for their own generation and for future generations. It’s time for Greek leaders to say what is necessary. It is a moment of truth. I will never let the Greek people go down. I know the Greek people don’t want to let down the European Union. Greece is a member of the European Union and the European Union should stand together. I’d like the people to vote “yes”. Greece is Europe and Europe is Greece. President François Hollande pleaded for a resumption of talks between Greece and its creditors before the final expiry of its bailout on Tuesday night, Ben Hall reports. “I want negotiations to resume, if the Greeks so decide, but it is up to them and them only to say so”, he said in a statement issued by the Elysée palace. Mr Hollande said Athens’ decision to hold a referendum on Sunday was a “sovereign choice”. But the fundamental issue at stake was “to know whether the Greeks want to stay in the eurozone”. The president said he was pushing for a resumption of talks not because the French economy was vulnerable to contagion — “the French economy is robust, much more robust than four years ago and it has nothing to fear from what may come about” — but because it had a duty to intervene to keep the euro together. Now on to questions: Do you think this government has enough credibility to undertake the necessary reforms if the people say yes? Juncker doesn’t really answer the question. Next questioner suggests that Juncker is fairly resigned and might this not go down well in Greece. Also, why did he quote Valéry Giscard d’Estaing if the latter has suggested Greece should leave the euro? Juncker says he does not think his message could be misunderstood or received badly by the Greek people. The message in the past was disastrous and it would be disastrous in the future if the people say no. I’m not a big fan of opinion polls but all of them say that the noble Greek workers are trying to do their best and stay within the eurozone. Juncker is then asked what a ‘no’ vote would mean. Juncker says: “No” would mean, regardless of the final question, that Greece is saying no to Europe. Juncker is asked if the creditors might hold further meetings this week. Juncker: Almost tacitly I’ve said my commission is a political commission and I’ve always wanted to play my role. The eurozone is not something that’s just technocratic. It’s animated by leaders who want to bring things together for Greece and the Greek people. And that’s the end of the press conference. Jucker’s speech has prompted some ironic tweets on Twitter. Here’s Matthew Holehouse, from The Daily Telegraph, drawing analogies with Britain’s EU referendum. Juncker says he feels a little betrayed and the institutions had done all they could have done. They had already moved mountains. There is no new proposals. 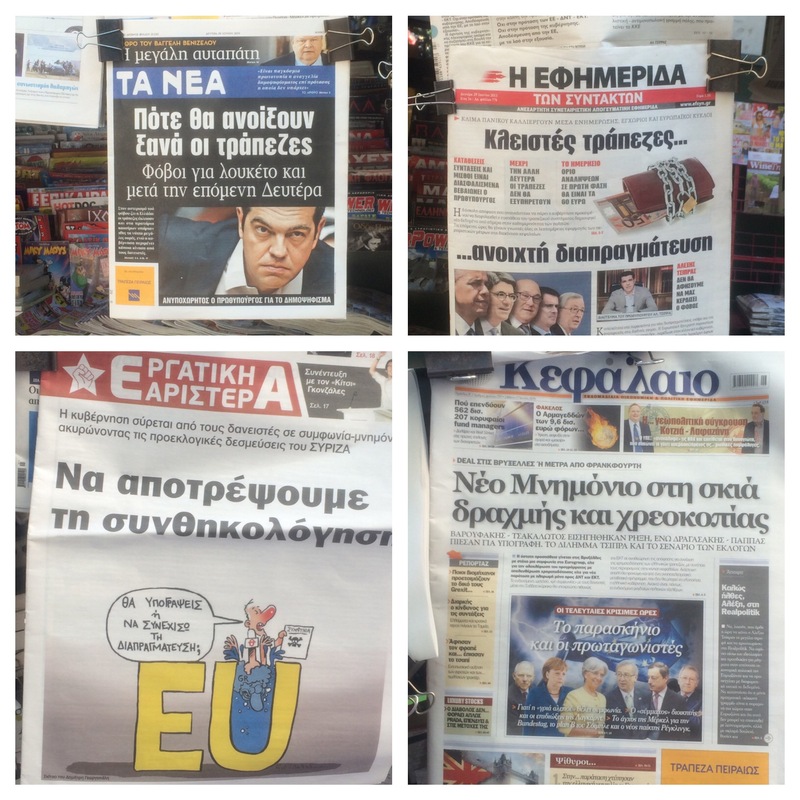 This, for the Greek people, is all about whether they want to be part of Europe. The door is still open but it’s up to the Greek people to vote yes. Further to Ferdi’s 12.31 post, there’s more Twitter chat that Juncker might not have helped the Yes cause…. Now that the political grandstanding is over…. The Greek Analyst, who has been tweeting relentlessly on the crisis, has this take on the Juncker speech which has just ended. In her first public comments on the Greek crisis since negotiations were abandoned at the weekend, German chancellor Angela Merkel gave Athens little hope of a concessionary new deal to avoid default and Grexit, writes the FT’s chief Germany correspondent Stefan Wagstyl. In very general remarks about the crisis, she spoke about “compromise”, “solidarity”, and the “contribution” of individual countries. While she avoided pointing the finger directly at Athens – or anywhere else – Ms Merkel indicated that she expected Greece to do more to cooperate with its European partners and rally around common European values. “Solidarity and responsibility for oneself are two sides of the same medal,” she said at a Berlin event to mark the 70th anniversary of her conservative CDU party. However at this point she praised Wolfgang Schäuble, her finance minister, for seeking compromises – even though he is widely regarded as having been particularly tough on Athens. Later she repeated a message that she has delivered before in the crisis: “If the euro fails, then Europe fails.” But she did not make clear whether this meant with or without Greece. She said that Europe could not ignore its principles. Greeks will be asked a complex 72 word question filled with acronyms and not mentioning the euro currency on Sunday, in a referendum that could decide its future in the single currency, Henry Foy reports. Respondents will be asked a simple yes or no. Gregory Farmakis has posted the referendum ballot on Twitter. Controversially, the government has placed the “No” above the “Yes”. The FT’s Lex team has offered some advice to fund managers wondering where to invest this week. Cyclical European stocks will get less attention, but may be a more interesting place for managers to look. They may be caught in the rush to cut exposure, but many of them are global companies that generate free cash flow and benefit from the weaker Euro. Siemens, EasyJet, Ferrovial, Peugeot, and others fell on Monday. Politics can hurt them, but their numbers still matter, too. Anyone in London looking for something to do at 6pm tonight could go down to Trafalgar Square to Greece Solidarity rally, where Labour leadership contender Jeremy Corbyn and Green MP Caroline Lucas will speak alongside a range of MPs and activists. “The stand-off we’re seeing this week matters to all of us. It involves a democratically elected government that’s trying – against all the odds – to protect people from the ravages of austerity, pitted against an unelected Troika hellbent on defying the will of the Greek people. “We are coming together today to stand with the people of Greece and say: no to austerity, yes to democracy. “The European Central Bank has declared financial war on Greece to push through austerity. But the people of Greece voted against austerity in their elections, and will be voting again this week. The Greece Solidarity Campaign is calling for a European conference to cancel Greece’s debts. He says it is hard to know what to advise Greeks on which way to vote. But he eventually lands on ‘no’. “A no vote would at least open the possibility that Greece, with its strong democratic tradition, might grasp its destiny in its own hands. Greeks might gain the opportunity to shape a future that, though perhaps not as prosperous as the past, is far more hopeful than the unconscionable torture of the present. The Greek Analyst has translated the Greek government’s Q&A on the rules regarding the capital controls. Salaries will still be paid and bills can still be paid electronically. Credit and debit cards of foreign banks, as long as they have been issued abroad, will be able to be used normally. For credit and debit cards of foreign banks that have been issued in Greece, same thing as with cards of Greek banks applies. German Chancellor Angela Merkel is holding a press conference. Stefan Wagstyl reports that she has not gone soft on Greek PM Tsipras. After setting out her position politely and somewhat obliquely in a speech, German chancellor Angela Merkel made clear at a press conference, that it was for Greece to move to a compromise – not its creditors. Merkel insisted that nobody would seek to influence the result of the Greek referendum from the outside. But she did say that not just the aid package but the euro itself was at stake. Wall Street’s main benchmarks are also heading lower, but the pace of the global flight from risk is easing as it reaches the US. The S&P 500 is down 0.8 per cent, with the Dow Jones Industrial Average down by the same margin. Back in Europe, the Xetra Dax 30 is down 2.9 per cent in Frankfurt, and London’s FTSE 100 is down 1.3 per cent. The CAC 40 in Paris is down 3 per cent. In Spain, the Ibex 35 is 3.6 per cent lower and Portugal’s PSI 20 is down 4.4 per cent. The region-wide FTSE Eurofirst 300 is down 1.8 per cent. More from Stefan Wagstyl at the Merkel press conference. As ever Angela Merkel leaves the door slightly open. She said in her press conference that she would be open to new talks with Athens after Sunday’s referendum “if the Greek government asks for this”. Mathieu von Rohr, a journalist at Der Spiegel, has a sarcastic take on the way the Greek government has designed the referendum ballot paper. Matteo Renzi, Italy’s PM, has just weighed in with a tweet, saying the Greek vote will be about keeping the euro or going back to the drachma. Here are some highlights from Martin Sandbu’s Facebook Q&A. I still don’t understand how a country with a population of less than 12 million can hold the entire EU to ransom!!??? Why Iceland managed to do it and Greece can’t? That’s an excellent question. In part it’s because the eurozone early on chose to think that a Greek default (to private creditors as it was then) would be a disaster for everyone else. In part because market investors thought so too – and so troubles in Greece translated into trouble for other crisis-hit countries with high debt or big deficits. I live in Athens. I am Greek. One simple #not question. What would you vote? As things stand now, I would vote no, on the basis that it is possible to stay in the euro (uncomfortably) after a default. It’s painful but possible, and better than leaving the euro. I have written about how here: http://www.ft.com/…aa4-bd9a-11e4-8cf3… and here: http://www.ft.com/…fc6-1e3c-11e5-ab0f…. But I’m hopeful that a better deal can be struck and would vote yes for something that recognises the flaws in the previous policies. Do you think a national currency without serious foreign reserves is inconceivable? Speaking about the drachma of course. Venezuela: $19bn. Both are struggling to make it. Greece = LESS THAN €2BN in reserves. 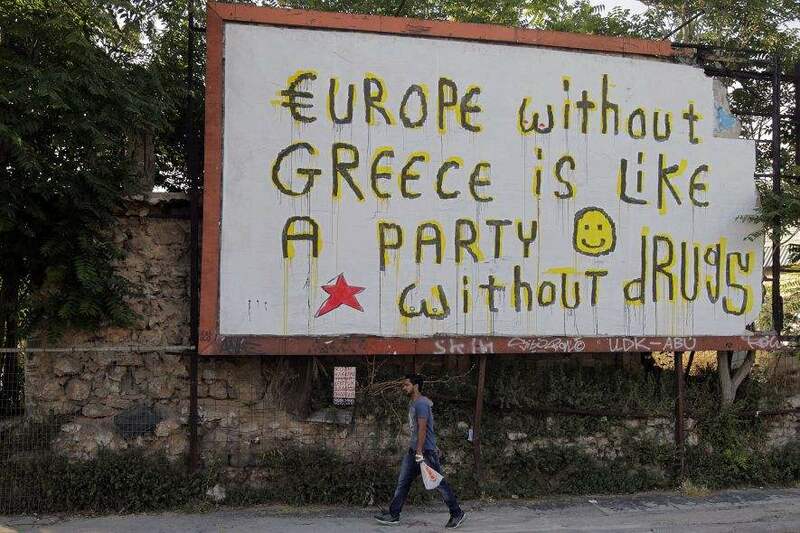 I can only think that the Greek gov’t knows that as well. So how are they going to switch to drachma with almost NO foreign reserves? It is conceivable. Most currencies are after all “fiat currencies” which means they are not formally backed by anything. But without foreign reserves, a country could not defend any particular level of the exchange rate. As a result it would be very volatile – and to begin with, fall very low. This is one reason why Iceland put foreign exchange controls in place in 2008 – they feared capital outflows would overwhelm reserves. Considering that the majority of Greek exports probably don’t actually leave the eurozone, will Greece profit economically from the potential currency devaluation coming along with a Euro-exit? How do you think the current situation could have been avoided not taking the unwillingness of the Greek government to collaborate in account? Should there have been a more expansive debt-cut in first place? Capital Economics has some sobering words on the outlook for European markets. Although some of the initial reaction in the markets to the decision by the Greek authorities to hold a referendum has been unwound, there is scope for renewed volatility in the event of a near-term Grexit. Our sense is that the bonds of other highly-indebted euro-zone governments are comparatively vulnerable, since their yields remain very low. The latest twists and turns in Greece’s bailout drama pulled the rug from under European and US stocks but a sell-off in “peripheral” eurozone government bonds was largely contained and the euro staged a remarkable rebound after an early slide, writes Dave Shellock. Athens’ unexpected call late on Friday for a referendum triggered widespread expectations that markets would see extreme volatility when trading resumed. The euro duly sank nearly 2 per cent against the dollar in Asian trading to briefly stand below the $1.10 level. But the single currency recovered its poise as the session wore on, helped in no small part by intervention from the Swiss National Bank to curb “flight to safety” buying of the franc. Indeed, by the close of European trading, the euro was up 0.2 per cent against the dollar at $1.119, 1.1 per cent stronger against the Swiss franc and 1.5 per cent firmer versus the yen. European equity indices pulled off the day’s lows, with the Xetra Dax in Frankfurt closing 3.6 per cent lower having earlier fallen 4.6 per cent. The index rose 4 per cent last week. French, Italian and Spanish stocks fell between 3.8 per cent and 5.2 per cent while on Wall Street, the S&P 500 was 1.2 per cent lower.. Among “peripheral” eurozone government bonds, Portugal’s 10-year yield rose 35bp to 3.06 per cent. Greece’s two-year yield soared more than 13 percentage points to 34.47 per cent, according to Reuters data.